In a RacinToday exclusive series, Eddie Wood, one of the second-generation members of the team, will discuss what he considers the top 10 wins in Wood Brothers history. The wins aren’t ranked in any particular order. This week’s entry recalls the team’s first superspeedway victory. It came on Oct. 16. 1960, at Charlotte Motor Speedway in the inaugural National 400. Eddie’s dad Glen recalled that he initially didn’t plan to enter a car in the race, since a tire test before the event indicated problems with a rough racing surface. 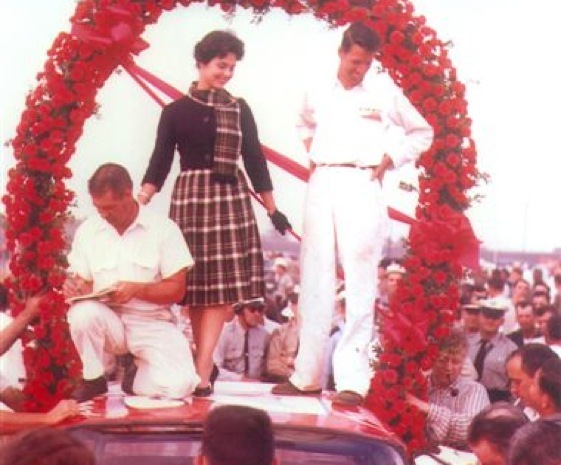 But Wood’s old friend Curtis Turner, a co-owner of the speedway, convinced him to bring his Ford to the race. “I didn’t have anybody to drive it, so Curtis said he’d drive it,” Glen Wood said. The plan was for Speedy Thompson, who had been sitting on the sidelines for most of that season, to take Turner’s place in the Holman-Moody Ford. But Turner’s duties as track owner were consuming so much of his time that Thompson wound up running some of the practice sessions in the Wood’s No. 21 Ford. Finally, after it was evident that Turner wouldn’t be able to give the car his full attention, the decision was made to put Thompson in it for good. When it came time to qualify, Thompson convinced the Woods to use baby powder on the car instead of wax to make it slicker and faster. And he didn’t want anyone else to know his secret, which posed a problem. While Wood isn’t sure whether the baby powder helped or not, Thompson ran fast, qualifying third behind Fireball Roberts and Jack Smith for the 400. Wood is sure about one factor that contributed to the speed. The car was purchased from a junkyard. Originally a street car (this was when stock cars were pretty much stock cars), the interior of which had burned in a fire. But that was a good thing. Gone were all the heavy soundproofing materials and glue and such that were a part of a street car. Wood also figured that in his team’s favor was the fact that Thompson, a very capable driver, had been out of action for a while and was anxious to prove he could still drive. “It livened him up,” Wood said, explaining that Thompson and his brother Jimmy were much like the Allison brothers – Bobby and Donnie – in their day. During the race, the No. 21 was one of the leading contenders. Eddie Wood recalls listening to the broadcast on a console radio from the family home in Stuart, accompanied by his brother Len and a neighbor lady assigned to watch the youngsters that day. In the closing laps, Fireball Roberts was leading but blew a tire and hit the wall. Thompson took over and sailed to victory, one lap and 12 seconds ahead of runner-up Richard Petty. The winner’s share was $12,710 plus a new convertible. Thompson kept the car, paying Wood for his share. The victory and the money won that day were a major turning point for the Wood Brothers team. The good times continued into the next week’s race at Richmond. Immediately after the Charlotte win, Richmond promoter Paul Sawyer called and offered Wood $2,500 to bring Thompson and the winning car to his track and added another grand if he’d bring a second car for Joe Weatherly. “Paul was pretty good about getting something while it was hot,” Wood said. And Sawyer was spot on. Thompson qualified on the outside pole at Richmond and dominated the race, leading 173 of 200 laps to score his 20th and final Cup victory. He raced just eight more times in his Cup career, choosing instead to concentrate on Late Model races. He died just after crashing in an April 2, 1972 at Metrolina Fairgrounds in Charlotte, possibly after suffering a heart attack. He would have been 46 the next day. To follow up on his breakthrough 1960 season, Wood bought a new 1961 Ford Starliner, turned it into a race car and was back on the NASCAR trail. More importantly he offered the car to Ford, which wasn’t officially involved in NASCAR at that point, to conducts tests at Concord, N.C. Soon Ford was officially back in racing, and the Woods were part of their plan. “I’ve been with Ford ever since,” Wood said.